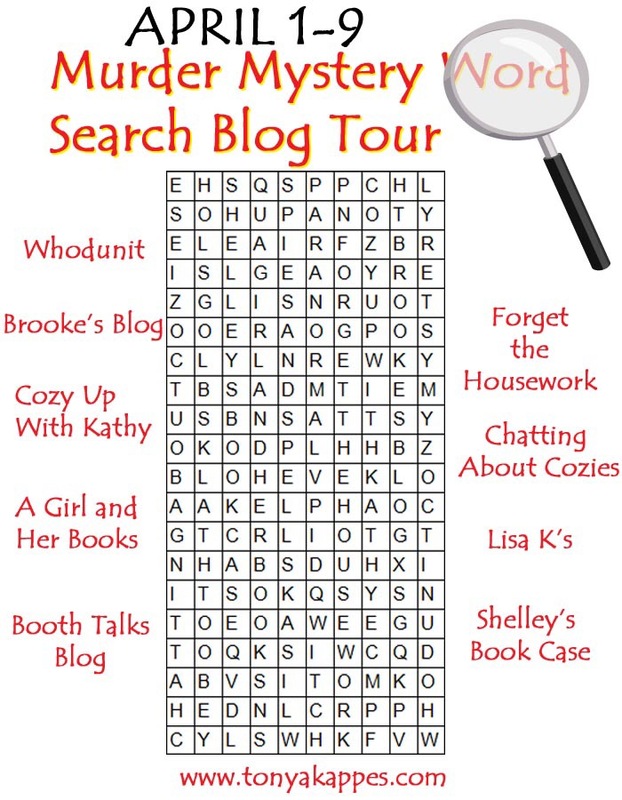 Booth Talks Books: What inspired you to make your first book, Second-Hand Murder, a paranormal cozy? Would you define it as a paranormal cozy? Blair Merrin: I don’t actually define it as a paranormal cozy, but I think it definitely has a foot in both worlds (pun fully intended, lol). Cozy readers will probably enjoy the tight-knit relationships and positive/funny interactions between characters. Bandit Hills has some decidedly different folks in town, and they all try to accept each others differences without making a fuss over them. Paranormal readers will hopefully appreciate the strange and creepy things that happen in Bandit Hills. If someone is strictly a paranormal/occult/horror reader, this book probably won’t scare them a bit, but Cozy readers can get a kick out of it, without having to double check the locks on the doors and windows. BTB: What kind of research did you need to do for your first book? BM: I happen to love ghost stories, and have always been fascinated by voodoo and other creepy or mysterious things, so, much of what came out in the book, I already knew. I did research some of the specifics regarding witches and voodoo dolls, though, as well as looking into the topography and climate in Tennessee – I’ve been through that beautiful state, but have never lived there. BTB: What inspired the town of Bandit Hills? To most people it seems like a creepy place but the residents seem to be pretty cool with it. BM: My mind wanders sometimes (occupational hazard, lol), and one day, I just started thinking…”What if I took a bunch of interesting people, some of whom had unusual habits and abilities, and put them in a secluded town, where weird was normal?” Yes, this is exactly the kind of thing that keeps me awake at night…and Bandit Hills was born. BTB: Have you ever personally been to New Orleans? What did you like most about it if you have? BM: I love N’awlins! The beignets and coffee, crawfish etouffee, and the voodoo shops like Marie Laveau’s. I admire the magnificent architecture, priceless antiques – the colorful creativity of the French Quarter of course, and the Laissez Les Bons Temps Roulez attitude of this “laid-back, anything goes” city. BTB: Which character was the most challenging to write about? Do you have a favorite? BM: Actually, these folks are so fun, that it’s an absolute blast creating their world! I think it’ll probably be a bit more challenging in Book 3, because there will be some complicated relationships that are dealt with (teaser!). BTB: Will we be able to visit Bandit Hills again in the future? If so, is there anything fun you can bate us with about book two? BM: Oh goodness yes, I’m already working on book tow, and loving every minute of it! I think that there will be several ladies swooning about a particular character in the second book. We meet Cassie and her mom in their antique shop, Miss Miscellanea, which sells other people’s castaway treasures. Some items are junk but others are down right fascinating. On this particular day, one of the most interesting finds of all shows up in a box. In an unmarked box, sitting along with other boxes full of uninteresting items, is a small, roughly made burlap doll with button eyes and yellow hair and a photo of a recently deceased woman. Cue creepy music, right? For this town however, just another Tuesday. Well, things are about to change. Cassie begins to wonder why someone would place a photo of a recently deceased woman with a voodoo doll and more than that, who the woman was. So, she begins looking into it out of pure curiosity. She then calls her old high-school friend turned investigator, Dash to see if he could help find out more about who she now knows is Stephanie Marshall after a quick look at recent obits on the internet. The woman has been dead all of a week. Their investigation uncovers a lot; too much in fact. They discover an ominous note, speak to a spirit from beyond the grave, break into this deceased Stephanie’s home, find a photo of her with a mystery man which leads Cassie to take a trip to New Orleans in search of said mystery man and there, encounter evil magic beyond her imagination. Let’s just say she comes home with a doll that looks like her. I will leave it at that. The ending is heart stopping and leads one with more questions than answers. Glad to know book two is in the works. I am so excited to get a chance to review Karoline’s new book. I will just go ahead and say that it was amazing. I loved the them of “crazy” running through it. Yes, I said crazy. Some of the people in this book aren’t quite right. I like it! Make sure to make your way to the bottom for the giveaway entry link! But, read the review first…okay? Okay! We are back in Destiny with Bread and Bagel owner, Molly Tyler and her mother is causing quite the scandal on the front page of the local newspaper with a mystery man. So goes the gossip of a small-town paper and how this quickly turns bad for Annie Tyler when the man, Philip Baldelli, is found dead and she becomes the main person of interest in his murder. The investigation focuses on a squabble over the library’s wanting to expand and the fact that the newly engaged Mr. Baldelli had been caught in the middle having said he would donate the money for said expansion. With people on both sides of the issue, the list of people involved in his murder is numerous. When his niece, perfume mogul, Serefina Alessi, that of whom he never had a relationship with, comes to town; another suspect gets added to the list. Once again, Molly goes in head first searching for the true killer to clear the innocent. She forms a group of amateur detectives from her monthly book club that don the name, “The Destiny Divas” to help Serefina and Mrs Tyler clear their names in the murder of Philip Baldelli. As they dig deeper, they begin to realize that the issue causing the murder is much deeper than money, the library and family. If not to add injury to insult, Molly’s new boyfriend, Detective Sean Corsino’s ex-sister-in-law comes to town trying to win him over by impersonating his dead former wife after he is involved in a work related accident. Molly eventually solves the death of Mr. Baldelli, but the road to that is paved with nothing but a path of crazy. That is the best way I can honestly describe it. Once you read this story, it might make you start questioning the people you know in your small town no matter how long you’ve known them. Now, that’s the mark of a good author. She got in my head and made me relate the characters to some of the people I have come across in my town, scratch my head and rethink how much I really know them. Who knew a small-town library could have so much drama? There was never a moment in Raisin the Dead where I was bored. Karoline never let the story lag or drag, which made for an enjoyable read. I loved seeing Molly grow in her relationship with Sean, her mother and her friends. This book really surprised me. I expected to like it, but not to fall in love with Destiny like I did this time. I am now sold out to this community and it’s characters. Time to find me an apartment there. I want to be a witch like Maggie Park and I want a car like Vinnie. A talking car would be handy, don’t you think? Seriously, I was drawn into the story of this Louisville Kentucky witch’s family from the first page and was taken on a wild ride throughout the entire book. When is my Witchy Hour? Maggie is living with her mother, aunt, sister and family familiars (witch assistants) trying to figure out what her life calling is, working at the family diner while trying to fit in as a mortal and be a learned witch at the same time. Talk about living undercover in plain site! The Park family lives in the south, interacting with people I can relate to oh so well! Being from the south myself, I can just hear all of the sayings coming from the neighbor, Mrs. Hubbard and Auntie Meme. A multitude of “bless your heart”, “fair to middlin” and others sprinkle the entire book and make me feel right at home. I even know neighbors with those plastic flowers. Bless their hearts…. Maggie is a go-getting, ready to escape the clutches of her family young woman in her late 20s who is ready to get on with her life. So, naturally she gets involved, by accident, in a drug bust where she meets a handsome guy, Mick, who ends up being an undercover agent for a secret organization. But, not before she zaps some poor guy into a cat. Sweet! After three bodies, finding out her car tends to talk and drive on it’s own, it’s Mick who starts to find Maggie irritatingly intriguing when the SKUL organization hires her as a secret citizen agent to work a case involving Mystic Couture makeup. She already lives undercover anyway, right? This book is fast paced, full of humor and fun suspense. You also get a good taste of the south with this amazing witch family. I loved how Maggie develops throughout the story. You can see her grow up and start to come into her own, taking responsibility for her powers and who she is to the family and the mortal world. 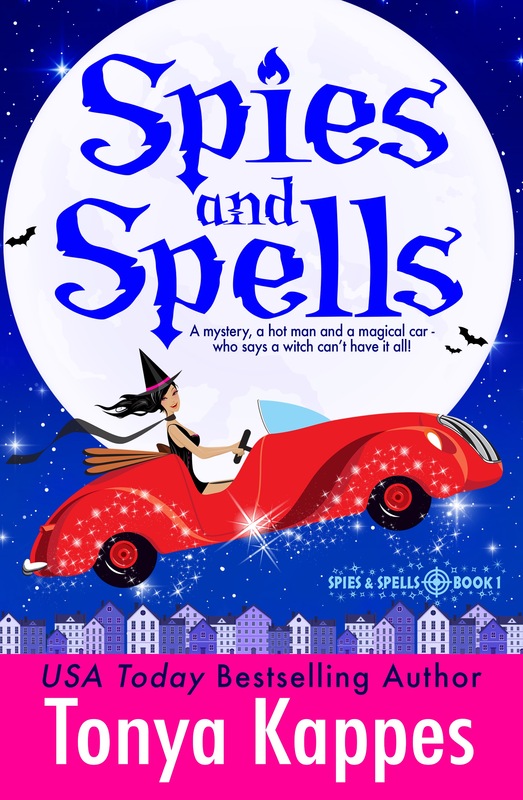 Spies and Spells is the first book in the new Spies and Spells series by author,Tonya Kappes. Buy Spies and Spells Here! Summer sends her characters off on a vacation, away from the sweets shop in Calgon owned by Missy and her husband, detective Chas Beckett to upstate New York. With their close friends, they open up their world to them, a side of the family that most don’t see and that Chas has tried to remove himself from, a life of luxury and over obsessive wealth were money and fast cars are the norm. Upon arriving, the Becketts, their Marine friend Spencer, and couple friend Kel and Echo take in the grandeur that was the life of Chas at one time. They meet his siblings who embraced the life of leisure and luxury instead of having working class jobs. We find out that even though he was far from his father during his (father) illness, Chas made the trip to see his father when his siblings who lived close did not. This endured me as a reader to the character of Chas. After showing off the car collection his father left to him, letting his friends drive their choice of the pricey vehicles and Kel nearly having a fatal crash (oh those guys and their cars), they decide to enter into an upcoming car race. Meanwhile, the ladies get chatted up by one of Chas’s former childhood tennis acquaintances, Muffy. She seems mysterious since she was eavesdropping. A horrible accident occurs on race day that is pinned on Chas due to a past squabble with the now deceased judge. Someone starts planting evidence and tries a little too hard to frame him for the murder and a detective Wallace is all over Chas with questions and an unhealthy hate. Luckily, being a detective and having friends who have your back (even in secret) always helps. And…what exactly is Spencer up to anyway with all that sneaking around? This was an easy read; quick and witty with a weaving of several plots going at once to keep you interest held. The language between the couples is as sweet as the treats Missy makes back in Calgon; lots of gooey goodness. So, you have to love a book with “cuddle wording” as I call it. I was able to understand the characters for the most part not having read the past books, but it would help knowing their background if you have time to go back and play catch-up. These are lovely characters that I look forward to following!